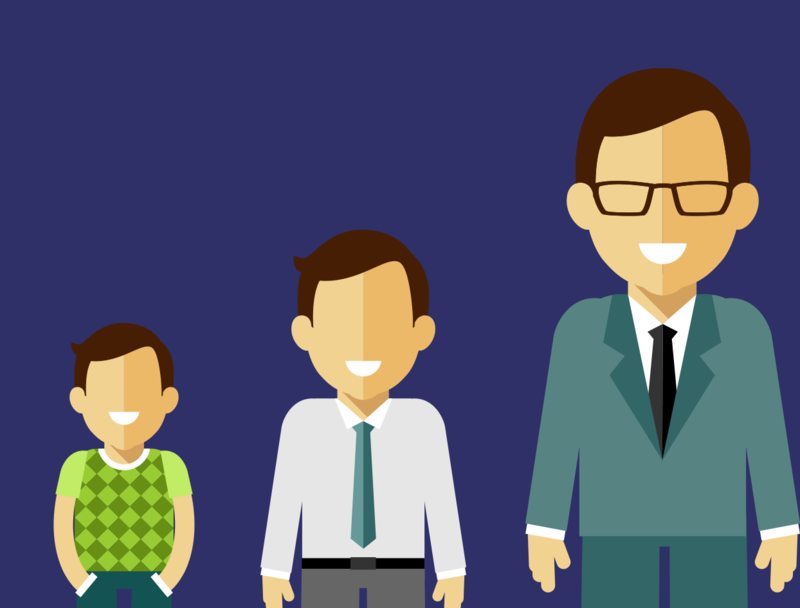 Scaling Your Content Efforts: Hire or Outsource? You’re sitting in your monthly marketing meeting, going over notes and discussing the need for producing high-quality content more consistently. Let’s lay the options out on the table, shall we? You can a) put another major project on your plate — or your overworked team members’ plates — and hope burnout doesn’t occur; b) spend time and money to recruit, hire, and train for the necessary roles to build an in-house content team; or c) outsource areas of your content creation efforts to an external party. First, let’s just acknowledge that the first option isn’t viable (or fair), so what we’re really talking about are two very different options: hiring internally or outsourcing your efforts. With 72 percent of large companies using a combination of in-house and outsourced content marketing efforts, it can be tough to decide what the right answer truly is (and where to start). To help you make this decision, we’ve created a handy list of pros and cons. Disclosure: Influence & Co. is itself an outsourced content marketing firm, so there is a bias toward outsourcing. But we also know this isn’t feasible for every company, so our goal is to show both the good and bad sides to each option. On that note, we’d like to encourage you to give us your feedback in the comments to help educate your peers, too! How much content are you looking to create over what time period? If you have a large budget with a very set plan you’ll be sticking to for the next 10 years, hiring internally may make sense. You can develop talent in the long term with internal hires and focus on building your own relationships with publications. What does your budget look like in the short term and long term? If you’re looking to test a content marketing campaign for the next six to 12 months and have a budget of approximately $100,000, then outsourcing is the right move. You don’t want to hire a content team of three (a writer, an editor, and a publication strategist), only to decide after a year that it’s not the right direction for your company — resulting in letting three good employees go. 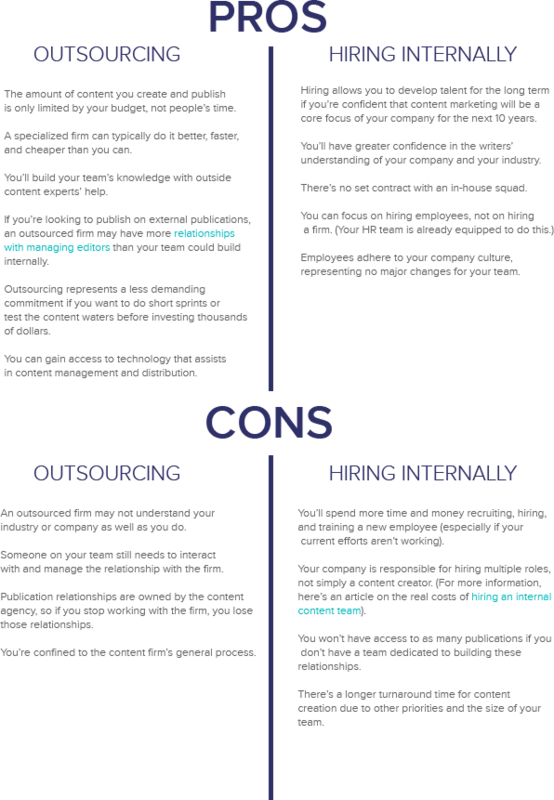 Finally, taking the leap and doing something about your stale (or nonexistent) content is a major step, so choosing between in-house hiring and outsourcing is a big decision. Evaluate your company’s long-term goals, the team’s capacity, and your employees’ expertise in content marketing. Educate yourself on your options; once you make your decision, get excited — the ROI opportunities that content marketing can deliver can be pretty rewarding. Did I miss any key points in my list of pros and cons? Let me know in the comments! 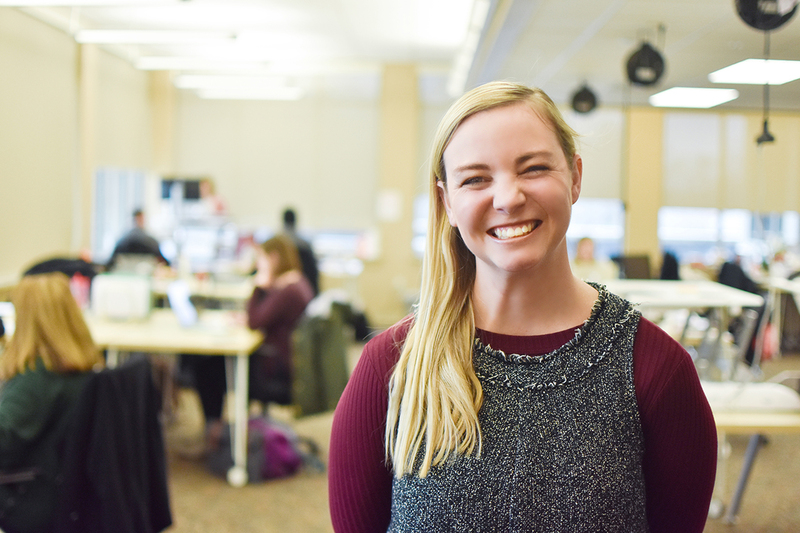 Kelsey is the CEO and cofounder of Influence & Co. She loves reading, learning, golf, orange Gatorade, and, most importantly, her amazing I&Co. team.